Preheat oven to 425°F. Coat bottom of baking dish with 1 tablespoon of olive oil. Place ribs in dish, separating them slightly. Drizzle remaining 1 tablespoon olive oil over top of ribs and rub to coat. Sprinkle seasoned salt lightly over all. Place sliced onions on top of ribs. Roast ribs at 425°F for 30 minutes. Meanwhile, in medium saucepan over medium heat, combine water, ketchup, Worcestershire sauce, chili powder and red pepper sauce. Bring to boil. Reduce heat to low and continue to simmer sauce until it is reduced and thickened a bit. After 30 minutes of roasting, pour BBQ sauce over ribs, reserving about 1 cup for later. Reduce oven temperature to 350°F and bake ribs another 60 minutes (or longer, depending on thickness of ribs), basting with sauce every 15 minutes. Ribs are done when meat is tender and cooked through, and the internal temperature reaches a minimum of 145°F. You can cover the pan loosely with foil for the final 30 minutes of baking if the ribs appear to be drying out. Be sure to keep basting the meat frequently to keep it moist and flavourful. 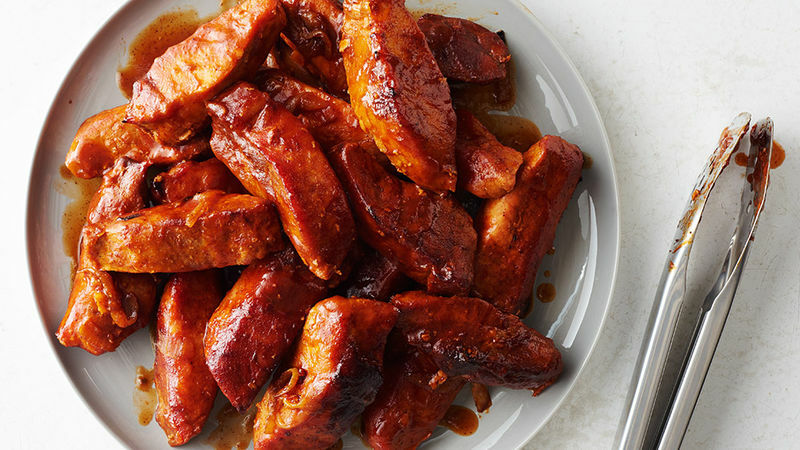 Boneless country-style pork ribs can be found right next to pork chops in your grocery store. For an easy make-ahead freezer meal option, split recipe between two pans and freeze one for later. This recipe also multiplies well to feed a crowd. Before you start basting, reserve some of your BBQ sauce to serve hot at the table with the finished ribs. If needed, cover ribs with foil for the final 30 minutes of cooking to keep them from drying out. Continue to baste every 15 minutes. When the ribs are done, they look all glazed and wonderful. And you can’t even imagine how good they smell!